CPSE ETF OFFERS INVESTMENT AT A LOW EXPENSE OF 0.0095% p.a. 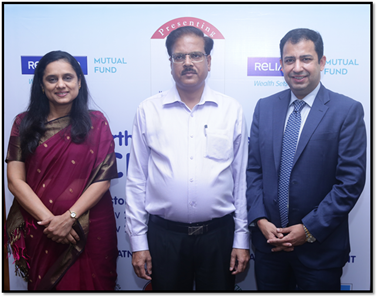 Chennai, November 20, 2018: Reliance Mutual Fund (RMF) today announced Further Fund Offer 3 (FFO3) of its Central Public Sector Enterprises - Exchange Traded Fund (CPSE ETF). This FFO3 is part of the Government of India’s overall disinvestment program, announced earlier by the Department of Investment and Public Asset Management (DIPAM), Ministry of Finance, using the ETF route. Reliance Mutual Fund proposes to raise upto Rs.8,000 crore (US$ 1.12 Billion) in FFO3 as “Initial Amount” plus an “Additional Amount” (if any) based on instructions of The Government of India. “The Further Fund Offer 3 in the CPSE ETF is part of the government’s larger disinvestment program that was announced earlier by the Ministry of Finance. We feel confident that the timing of the issue will help investors benefit from their exposure in a diversified basket like CPSE ETF that includes a list of distinguished PSUs who are leaders in their respective sectors. “We are delighted to announce the CPSE ETF FFO3. It offers a compelling opportunity for investors, especially retail and retirement funds, to invest in the India growth story at an attractive valuation, low expense and embedded discounts”, said Mr. Sundeep Sikka, ED and CEO, Reliance Nippon Life Asset Management. The FFO3 is open for all categories of investors including Anchor Investors, Retail Investors, Retirement Funds, QIBs, Non-institutional investors and Foreign Portfolio Investor (FPIs). As part of the FFO3, an upfront discount of 4.5% is being offered to all categories of investors. The dividend yield of Nifty CPSE Index is approx 5.25% (Source NSE: Data as of October 31, 2018), further adding to the overall merit of investing in this ETF. In addition, CPSE ETF has a very low expense ratio of 0.95 bps. FFO3 to open and close for Anchor Investors on November 27, 2018, and for Non Anchor Investors on November 28, 2018, and close on November 30, 2018. “We would like to reach out to retirement funds to invest in FFO3 and consider this as an opportunity to secure their funds and benefit from the growth of these PSUs - some of which are Navratnas, Maharatnas, Miniratnas and are either sector leaders or near monopolies in their respective sectors”, said Mr. Sikka. DIPAM has appointed ICICI Securities Limited as the advisor for the FFO3. CPSE ETF is a passive investment fund that was created to help the government in its disinvestment program of divesting stake in select Central Public Sector Enterprises (CPSE) through Exchange Traded Funds (ETF). The fund invests in the Nifty CPSE Index stocks – that includes eleven PSU companies selected on the basis of established track record, government holding, market capitalisation, dividend history, sector representation, etc. - in the same proportion and weightage as of the index. Post the successful New Fund Offer (NFO) in 2014, GOI decided to launch two more tranches / Further Fund Offer (FFO) in Jan & Mar 2017 which evinced a very good response from investors. CPSE ETF NFO, FFO & FFO 2 received overwhelming response as its collection was Rs.4,363 Crs, Rs.13,705 Crs and Rs.10,083 Crs respectively, out of which Rs.1,363 Crs, Rs.7,705 and Rs.7,583 Crs respectively was refunded to investors due to the limited issue size of Rs.3,000, Rs.6000 Crs and Rs.2,500 Crs respectively. Reliance Nippon Life Asset Management Limited - RNAM (formerly Reliance Capital Asset Management Limited) is one of the largest asset managers in India, managing (directly & indirectly) assets across mutual funds, pension funds, managed accounts, alternative investments and offshore funds. RNAM is the asset manager of Reliance Mutual Fund (RMF) Schemes. RNAM also has the mandates for fund management from Employees' Provident Fund Organisation (EPFO), The Pension Fund Regulatory and Development Authority (PFRDA) [as a Sponsor of the Pension Fund Manager] and The Coal Mines Provident Fund Organisation (CMPFO). RNAM acts as an advisor for India focused Equity and Fixed Income funds [in Japan (launched by Nissay Asset Management), Korea (launched by Samsung Asset Management) and in Thailand (launched by BBL Asset Management)]. RNAM also manages offshore funds through its subsidiaries in Singapore and Mauritius and also has representative office in Dubai thereby catering to investors across Asia, Middle East, UK, US, and Europe.